Established in 1957, Edison Park Inn has become a neighborhood icon. Serving local residents quality food and drinks and providing a place to view local sports teams. Registered as a Hawks Bar, Patrons can come and watch all Blackhawks games, as well as Bears, Cubs and White Sox games. Located across from the Edison Park Metra station we are conveniently located with easy access from the city and suburbs. Please see our Catering packages we have available. We can accommodate a variety of events from 10 people up to 250 people. 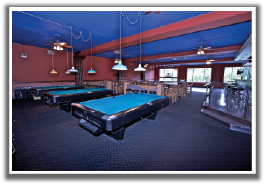 Enjoy a private bowling party for your company or organization in our updated 8 lane bowling alley. With classic scoring and a classic feel, our bowling lanes will make any party or event a hit! Call for more details.